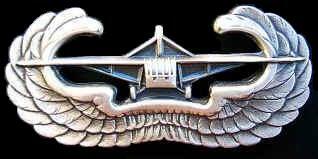 The 81st was created on September 4th , 1942 at the Clairborne Camp in Louisiana under the command of Lieutenant-Colonel W.C. Scoggin. The soldiers of this division came from the 401st and 327th GIR units. The third battalion minus "K" Coy of the 401st became the “C” and ‘F” batteries. "B" Co of the 327th GIR gave ”B” battery of the 81st. First and second platoon of the antitank companies of the 327th became “A” battery. Heavy companies “H” and “E” of the 327th became “D” and “E” batteries. HQ, 3rd Battalion of the 401st and 1st Battalion of the 327th GIR became the HQ of the 81st. Medical staff came from the medical companies of the 327th GIR and 401st. Each battery held 71 soldiers, the medical detachment 23 and the HQ 26. “A”, “B” and “C” batteries are antitank batteries with each eight 37mm canons that later will be changed for a 57mm British heavy gun, due to the fact that it could be airlifted by the gliders. “D”, “E” and “F” are anti-aircraft batteries with 12 anti-aircraft guns, .50 calibre air-cooled, mounted on a M3 carriage. After the battle in Normandy, the guns were fixed and could also serve to support infantry, who only had .30 calibre air-cooled machineguns. On the 29th September 1942, the battalion is sent to Fort Bragg in North Carolina. Here is receives trains with new weapons, loading of gliders and take-off and landings. The battalion participates at all 101st manoeuvres. After this, it is sent to New York and goes on board of the HMS Samaria on September 5th, 1943. The battalion disembarks at Liverpool in Great Britain to find itself at Basildon Park near Reading, Berkshire. Physical training intensifies (with long and short marches), placing the cannons into battery, the use of the gliders and tactical exercises. On March 25th, 1944 the commanding officer Lieutenant-Colonel Scoggin is replaced by Lieutenant-Colonel X.B. 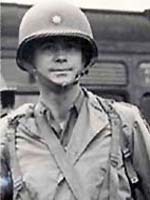 Cox Jr.
On June 6th, 1944 "A" and "B" batteries arrive in Normandy with their gliders on H+2. Batteries "D", "E" and "F" will arrive by coastal landing with the assault of the 4th Infantry Division at H+15. They install their first anti-aircraft defence on the beaches until June 11th. After this, they are relieved by the VII Corps. They join up with the battalion to form the defences of the division, important bridges in the area around Carentan. Two enemy planes will be shot down on the 6th and 7th June. The following operation in which the regiment participated was operation “Market Garden”, the invasion of Holland. It was a daring plan, prepared by the British Field Marshal Montgomery and would be the first daytime airborne assault since the attack on Crete by the Germans. The 81st participated 73 days of which 48 on the frontline. After the operation they were withdrawn to France at Mourmelon, in order to prepare for the next mission. In the morning of December 16th, 1944 the Germans launched a major offensive through the Belgian Ardennes, where VII Corps assured the American defences. Their main objective was to retake the port of Antwerp,that was the main key to allied supplies. Until that moment, the 101st and the 82nd were resting in France and kept in reserve. The 101st was quickly directed to the town of Bastogne, strategic point for the Germans due to a crossroads of several major roads that they needed for their offensive. The 101st arrived in the night of December 18th with trucks. From the 19th until the 22nd, the Germans had completely encircled Bastogne. On the 23rd they send a negotiator asking for the surrender of the town. The U.S. answer was “Nuts”. Colonel Harper, in charge of the sending the message to the Germans had to explain. The answer is negative, go to hell! Even encircled and outnumbered, the Americans resisted all attacks launched by the Germans. 3rd Army’s 4th Infantry Division broke through the encirclement. On February 23rd the 81st returned to Mourmelon in France where the 101st Airborne Division received the Distinguished Unit Citation for its bravery in Bastogne from the hands of General Eisenhower. April 2nd, 1945 the 101st was sent to the Ruhr sector in Germany. The division found itself near Düsseldorf. On May 4th and 5th, the 101st received its last mission, to go to Berchtesgaden, the “Eagle’s Nest” of Hitler and to eliminate any resistance pockets of the German army. 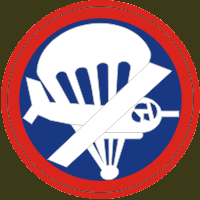 In September, the battalion was back in France and was dissolved in December 1945.